The place for all things related to the "sacred scale". 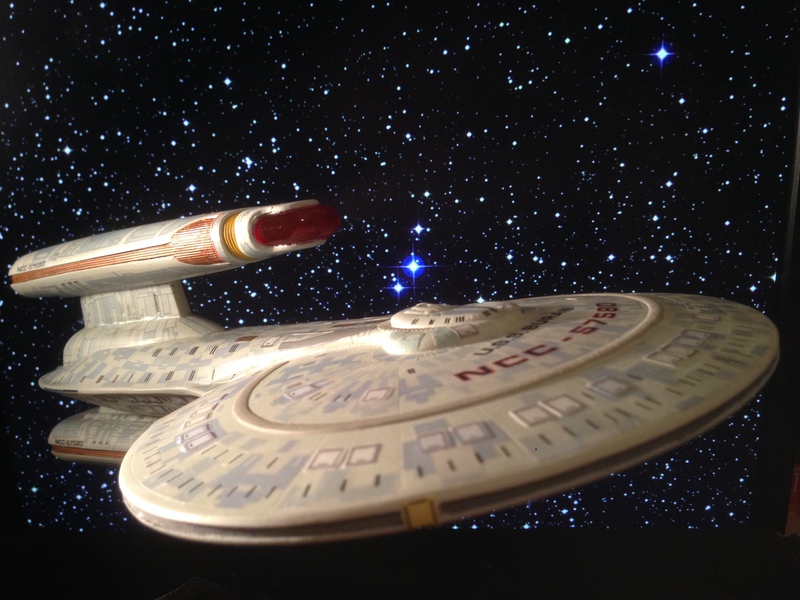 This month Round2 is re-issuing the 1701D 1:2500 scale model. Lovely box art, inline with the past several releases. The kit is mostly unchanged, but it does now have a dome base! I'm actually pretty happy about that. I love having matching models, and I always hated trying to find that odd sized rod for these 1:2500 scale ships. The release still includes all the aztec decals. But to me they look more blue than previous releases. Can anyone let me know if you also think these look more blue? I saw that AndyH just did a fantastic build, Andy do you think these are different? Last edited by Steam235 on Thu Jan 31, 2019 6:03 am, edited 1 time in total. Here's a video looking at the plastic parts. Yes, definitely a darker blue. This will be the 3rd change in decal colour I believe. First ones were a greenish blue, 2nd ones were more blue but lighter than these. Too bad it still uses the inaccurate patterns on the underside of the cobra. Would have thought they would have corrected it since they also corrected it on the new 1/1400 decals.. I concur with others, those are way too dark. And because the lifeboats and windows are on them, one cannot simply overspray with the base color to lighten it up. The fit is very nice on this kit, There's only one thing that really must be cleaned up, and that's the horizontal seam along the front of the warp nacelles. I think the 1701C uses a third piece on it's nacelles so that you have nice domes without seams. The nice part about this seam is that it ends up being raised. Use a nice solvent cement and press it together, you won't need putty, just some light sanding to make it nice and smooth. Fit was never an issue with the old D. Finish on the other hand. That is an issue. The kit doesn't need to many details to be painted. I painted the nacelle grills, the phaser strips, the shuttle bay doors, and the deflector dish. I just masked and airbrushed those colors. I know it's silly but I am thrilled this kit is finally coming with a base.